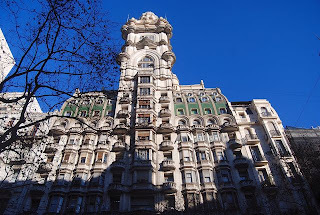 It’s not unusual, in walking around Buenos Aires, to find film crews on the streets and even the balconies of the city. 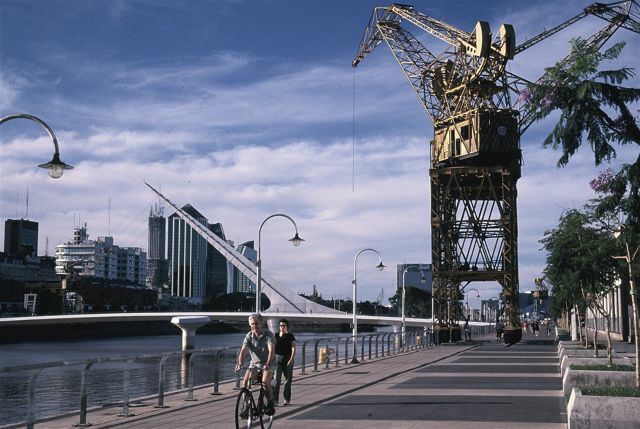 Argentina has long had a vigorous film industry and, ever since the economic meltdown of 2001-2 reduced the costs of filming, editing and related activities, foreign filmmakers have found the city a good place to work. 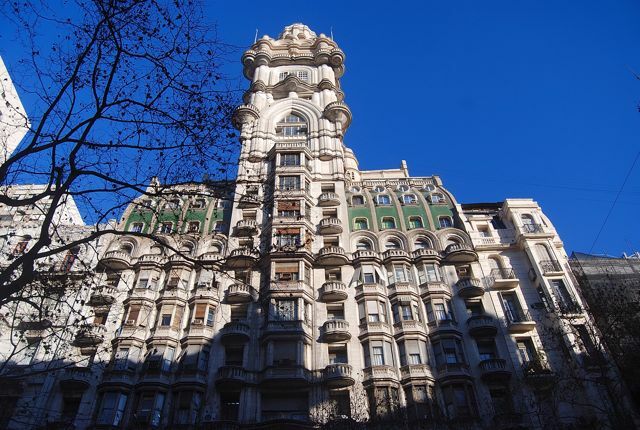 Sometimes, but not always, that’s meant filming here, but even before 2001 Buenos Aires made frequent appearances on overseas screens, thanks also to some high profile Argentine directors. 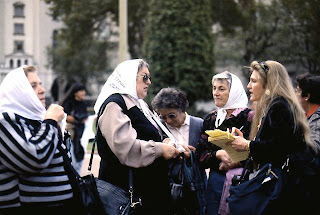 Visitors can easily inspect some of those locations, starting with the Plaza de Mayo, featured in Luis Puenzo’s 1985 Oscar winner The Official Story, with footage of protests by the famous Madres de la Plaza de Mayo (pictured above). In the historic Club del Progreso, visitors can now eat in the restaurant whose dining room hosted a notoriously creepy scene in Christopher Hampton’s “Dirty War” film Imagining Argentina (2003), which starred Antonio Banderas and Emma Thompson. In search of his missing wife, Banderas’s character Carlos also visits the Escuela de Mecánica de la Armada, a notorious torture center. In an entirely different category, Christopher Lambert’s immortal Connor MacLeod battles an equally immortal opponent in a swordfight in the Avenida de Mayo’s Palacio Barolo (pictured here) in Russell Mulcahy’s Highlander II: the Quickening, the weak sequel to an earlier hit. Mulcahy also shot scenes at Estación Medalla Milagrosa, an outer stop on Línea E of the Subte in the barrio of Parque Chacabuco. In director Fabián Bielinsky’s Nine Queens (2000), the city itself is a neo-noir star, but with few clearly identifiable destinations except for the recycled promenade of Puerto Madero (pictured here), where con-men played by Darín and Gastón Pauls themselves get ripped off in a unique chase scene. Leticia Brédice plays Darín’s younger sister, in a scene at the barrio’s Hilton Buenos Aires hotel. 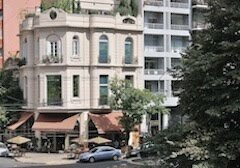 In his family drama Tetro (2009), Francis Ford Coppola probably made the most extensive use of Buenos Aires by any foreign director - and definitely made it a more high profile location. The bulk of the story takes place in La Boca, using standard locations such as the curving Caminito pedestrian mall, but also side streets that are harder to identify. 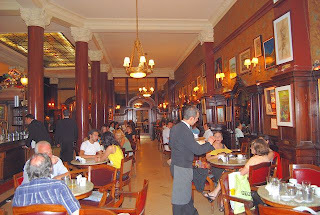 At the same time, Coppola used the interiors of iconic sights such as the Café Tortoni (pictured here, used to stage a birthday party for one of the characters) and the Teatro Nacional Cervantes (site of an elaborate memorial service for another character). For a cemetery scene, Coppola chose the sprawling open spaces of the Cementerio de la Chacarita rather than the city’s more famous, but confined, Recoleta. Coppola also shot several scenes in the cobbled streets of San Telmo, as did Puenzo when he cast William Hurt, Raúl Juliá, and Robert Duvall, among others, in an adaptation of The Plague (1992), where a thinly disguised Buenos Aires represents Albert Camus’ Algerian city of Oran. Duvall roamed the same streets as a hit man in his vanity project Assassination Tango (2002). Duvall is a dedicated dancer, but he can’t match the vanity of British director Sally Potter in The Tango Lesson (1997), as she travels to Buenos Aires to tackle her mid-life crisis by dancing. Potter, at least, had the good sense to use the classic Confitería Ideal to offset her egocentric exercise. 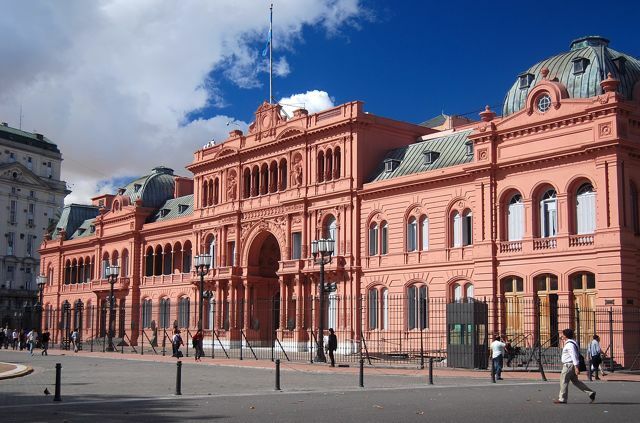 La Ideal, of course, was even more notorious for scenes in Alan Parker’s dreadful Madonna-centric Evita (1996), whose balcony scenes at the Casa Rosada presidential palace (pictured here) return us to our starting point on the Plaza de Mayo. Most Northern Hemisphere residents think of the Southern Cone countries - Argentina, Chile, and Uruguay - as summer destinations. In the southern winter, of June, July and August, they tend to stay closer to home for their travels, but that means they often miss out on more distant attractions. Thus, over the next several weeks, I’m going to focus on Southern Hemisphere getaways for Northern Hemisphere residents at this time of the year. One of those is Chile’s Atacama Desert and, like the Mojave Desert of California and Nevada, it’s often best to visit in winter even though, because of the Pacific Ocean’s cool Humboldt Current, it stays far cooler in summer than the Mojave does. Still, the mild winter is ideal for exploring the backcountry even though the nights get chilly except along the subtropical coast, where temperatures remain comfortable all year, at all hours. Like the Mojave, the Atacama has its share of ghost towns and, to my mind, they’re one of its real highlights. 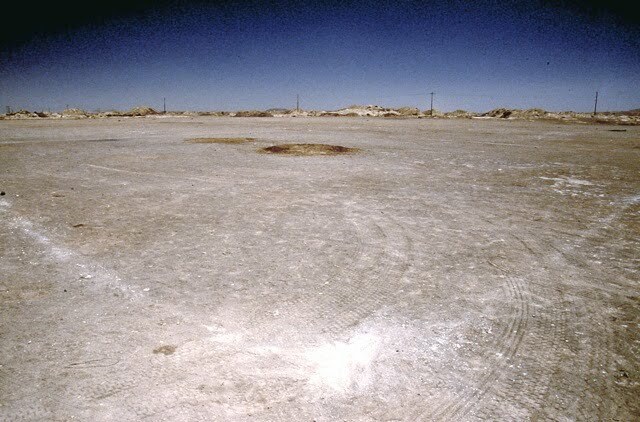 Unlike the scattered settlements of the Mojave, though, the ghost towns of the Atacama were sprawling company towns that grew up in response to massive surface mining for nitrates. 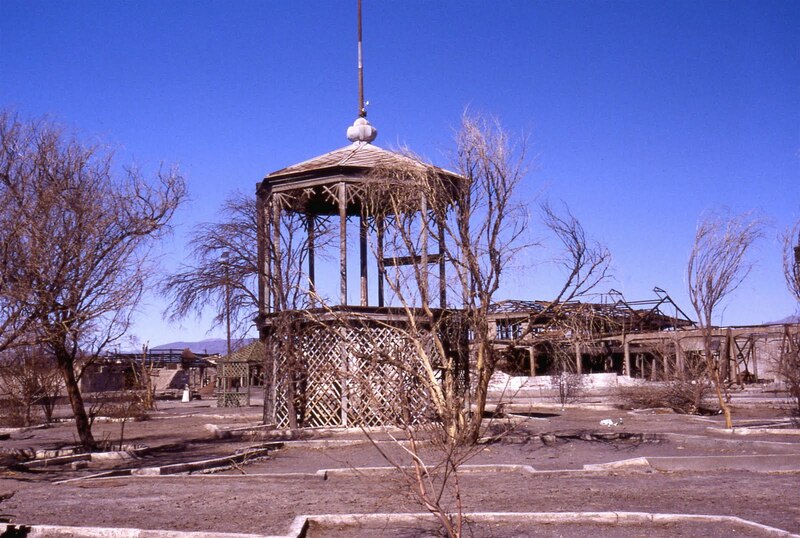 These oficinas operated from the mid-19th century to the mid-20th but, as the nitrate industry declined when petroleum-based fertilizers replaced nitrates for agriculture after World War I, they began to fall into disrepair. Many of them were dismantled for scrap or, infamously, robbed for their wood and other valuable building materials. Three large oficinas, though, remain reasonably well intact and easily accessible. On the high steppe about 45 km east of the city of Iquique, Humberstone and nearby Santa Laura are a combined UNESCO World Heritage Site that displays a remarkable number of amenities for nitrate miners, including the impressive Teatro Humberstone, built of Douglas fir imported from the United States, and an enormous cast-iron swimming pool that’s now rusting and waterless. When I first visited here, in 1979, you could actually walk around the ruins and even climb the rafters of structures like Santa Laura’s Planta de Chancado (ore-crusher, pictured here) but, today, authorities have put more of a premium on safety. Still, you can see walk inside many buildings, climb aboard rusting locomotives from the narrow-gauge rail line, and walk the wraparound porch the borders the Casa del Administrador (administrator’s house) and its tennis courts. 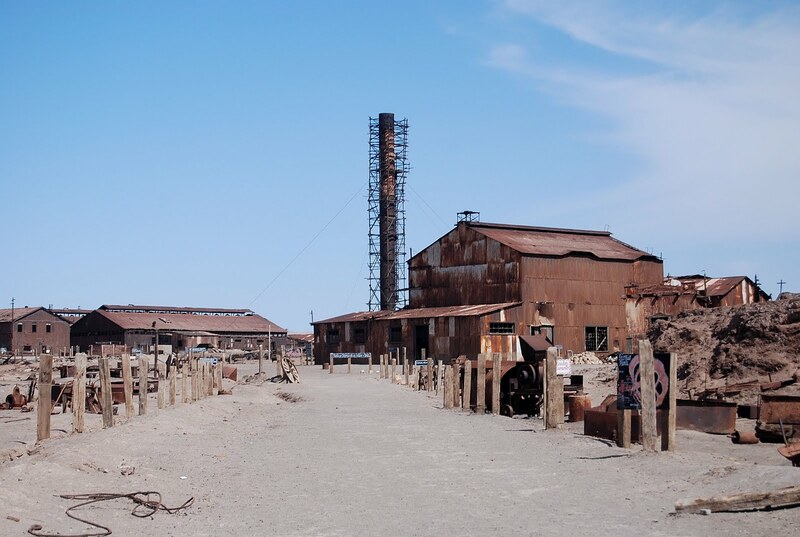 It’s easy to spend a morning, afternoon, or even a full day at one of the most picturesque ghost towns this side of Bodie (California). With frequent buses from Iquique, access is easy. 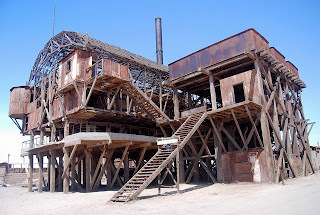 The other major ghost town, slightly less accessible than Humberstone, is Oficina Chacabuco (pictured at top), about 100 km northeast of the port city of Antofagasta. Opened in 1924 to accommodate the new Shanks system of extracting nitrate from ore, it closed its brief life in 1940. Occupying an area of 36 hectares organized in a regular grid, it included a theater larger and more elegant than Humberstone’s and, today, well-preserved frescos still overlook its stage. 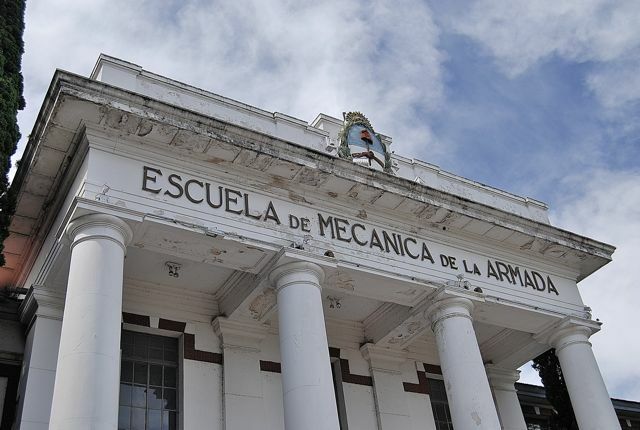 Chacabuco, though, also has a darker history - after the military coup of 1973, it was used to house more than 2,200 political prisoners and, though none were executed here, it was surrounded by land mines to discourage escapees. 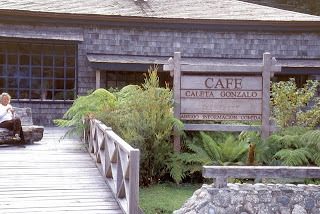 The upper levels of the theater include a photographic display of Chacabuco’s heyday, and information about the prison camp. Buses from Antofagasta to the city of Calama run along the highway but it’s about four km south of a major highway junction; northbound buses to the city of Arica, though less frequent, will drop you directly at the entrance road. The hop-on, hop-off tour company Pachamama by Bus includes Chacabuco on its Atacama itineraries, which continue to San Pedro de Atacama. In film and literature, Argentina is a country that lends itself to noir and neo-noir. 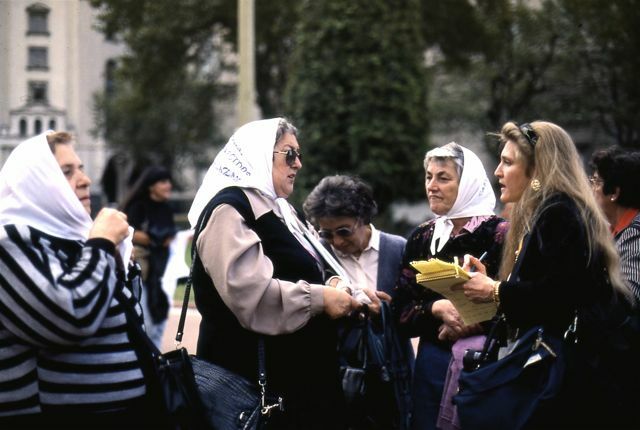 In the underrated Nine Queens (2000), which had only a brief run in the United States, the late director Fabián Bielinsky portrayed Buenos Aires as a city of con-men (and women) constantly seeking an edge over their victims and even each other; set in the Patagonian lakes district, his second feature El Aura (2005) is a drama of deceptive identity. Both films starred Ricardo Darín, as did Juan José Campanella’s El Secreto de Sus Ojos (The Secret in Their Eyes), which won this year’s Academy Award for Best Foreign Film. According to Publishers’ Lunch Daily, Eduardo Sacheri’s novel - the template for Campanella’s film - will soon appear in English translation under its original title - "The Question in Her Eyes" - thanks to New York City’s Other Press. 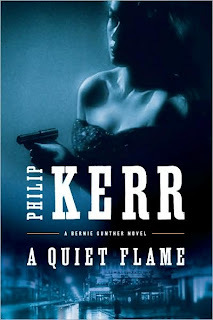 Given Argentina’s increasingly high profile, the country has also attracted foreign writers who have a harder time of it, such as US novelist Nathan Englander in the well-meaning but overrated Ministry of Special Cases (2007), set during the 1970s “Dirty War.” More recently, Scottish author Philip Kerr, who specializes in pre- and post-war Germany, has dispatched his Berlin detective Bernie Gunther to Buenos Aires in A Quiet Flame - in the company of Adolf Eichmann and other disreputable fugitives from post-war European justice in 1950. Unjustly accused of war crimes, Gunther himself soon finds himself in the Casa Rosada, Argentina’s government house, in the company of Juan Domingo Perón and Evita, where he is assigned to track down a serial killer whom Gunther may have investigated in pre-war Berlin. Kerr’s depiction of Argentina’s political intrigues, which owes much to journalist Uki Goñi’s The Real Odessa, is plausible, especially given the notorious “Directive 11” that made it official government policy for Argentina to reject Jewish refugees in the pre-war years (Argentina, of course, was not the only country to refuse Jews entry). That’s particularly unfortunate because he could have benefited from visits to Jewish community sights such as Retiro’s Museo de la Shoá, which shows how Argentine Jews were treated during this period and how some died in the Holocaust. He might also have avoided some egregious geographical errors that undercut the book’s strong points - Spanish author Manuel Vásquez Montalbán’s gourmet detective Pepe Carvalho gets around much more credibly in The Buenos Aires Quintet (1997), an excellent novel on "Dirty War" themes. There are countless unwanted Argentines in California, but they keep a far lower public profile than the barras bravas (soccer hooligans) expelled from South Africa during this month’s World Cup. Rather, they’re six-legged invaders who arrived surreptitiously in fruit shipments at the port of New Orleans about a century ago, and spread by rail around the country. Today, Argentine ants (photograph courtesy of Penarc) form mega-colonies that extend from the San Francisco Bay Area to San Diego. Coastal California’s mild climate, apparently, is particularly conducive to them, though they are also troublesome in Mediterranean Europe, Japan, and New Zealand. 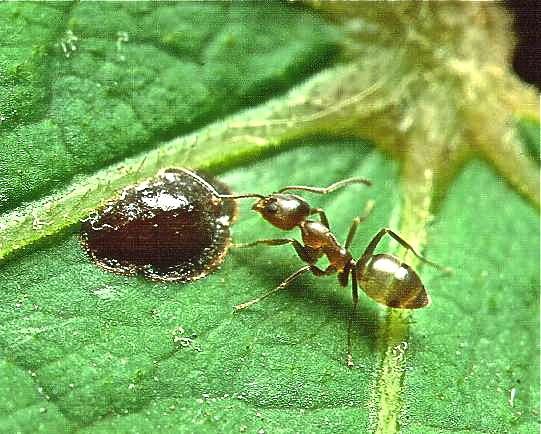 According to the Smithsonian Institution’s Mark Moffett, the “Indiana Jones of Entomology,” Linepithema humile is an aggressive species that has displaced or even wiped out native ants to the point that California now has an “ant crisis.” Unlike the state’s native species, Argentine ants do not disperse seeds of indigenous plants, for instance, and are unpalatable to native lizards. They also cause crop damage by encouraging aphids. In their home range in the Río Paraná lowlands, Argentine ants co-exist with other ant species, but in California they don't always co-exist among themselves - in reality, there are competing colonies at war with each other. They distinguish themselves by scent and, along the borders between competing colonies, their mortality rates can be astronomical. Those mortality rates, though, do not keep them from being a garden and household nuisance - according to Moffett, the average back yard garden in San Diego may be home to more than a million of these tiny creatures. During the rainy season, especially, they stream through cracks in the foundations or gaps in windows, to the point that it’s impossible to leave a dirty dish in the kitchen sink without attracting hordes of them. Moffett concludes his new book, Adventures Among Ants, with a chapter about the Argentine ant. He also spoke about the book, and Argentine ants, in a recent interview on the PBS radio program Fresh Air, with Terry Gross. For decades, the US presence in Latin America has been a controversial one, as Latin Americans - sometimes rightly, sometimes wrongly - have often blamed the “Colossus of the North” for their problems. Famously, the phrase “Yankee go home” was a warning that US citizens, or at least their government, were unwelcome south of the border. Even when they went to Mexico and beyond, they often preferred to keep a low profile. 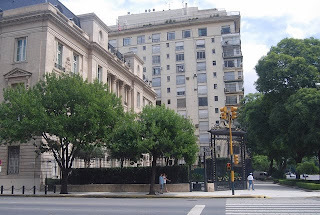 While Anti-Americanism has not gone away - though it was probably never so widespread as the cliché suggested - it ran deep among some sectors in Argentina, Chile, and elsewhere. Ever since the 1980s, when the South American dictatorships gave way to stable democracies and the region’s tourism industry began to flourish, it’s been barely a blip on the screen. 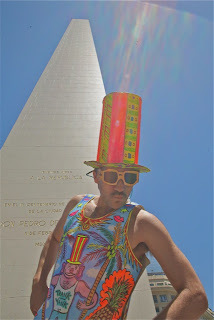 The Floridian influence is palpable in the colors of Tranqui’s trademark top hat, clothing, and accessories of “Deco-style Miami pastels, based in the Miami pop culture that I’ve grown up with. It’s really a mix of the Miami aesthetic with the porteño, including references to cultural and political icons” such as Uncle Sam, the Statue of Liberty, and the Gaucho Gil that adorn his designs. He carries a sketchbook to record, spontaneously, whatever attracts his interest. 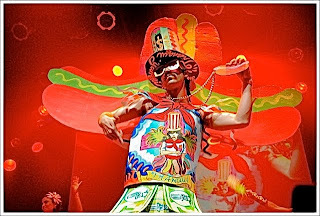 In the meantime, Tranqui has moved onto bigger stages, such as the Abasto neighborhood’s Uniclub and Palermo’s Niceto Club, where life-size versions of his disposable clothing have been a big hit at intermission runway shows (photograph by Eugenia Keis). So much so that a Córdoba club even paid his way there for an event and “The last couple shows, I even had somebody buy me the cardboard - fresh new cardboard.” At these venues, with a more art-friendly young crowd, it’s a bit less edgy than taking it to the streets. Meanwhile, when not working or performing, Tranqui has another, very American, hobby as the starting shortstop for the Buenos Aires Shankees, who play in the Liga Metropolitana de Béisbol. That started oddly as Paul Perry, who manages the team, saw his website and invited him to a game as the team mascot. When, after the game, Perry was discussing roster changes because several players were leaving the country, he volunteered to play and “Paul just laughed.” Since then, though, he’s become a regular performer with the Shankees - but minus his pastel wardrobe. In February of this year, Chile’s massive 8.8 Richter scale earthquake made international headlines but only the specific timing was a surprise - like the Pacific Coast of North America, Chile is one of the world’s most seismically active areas. The February event was unique only in its scale - three years ago, for instance, the coastal Atacama Desert town of Tocopilla suffered a little publicized 7.7 quake that destroyed 7,000 homes and, even today, more than 500 families are living in simple shelters known as mediaguas. When I first visited Tocopilla, in the early 1990s, it was a ramshackle town with a small port and huge thermoelectric energy station that still powers the massive copper works at Chuquicamata, some 130 km to the east. 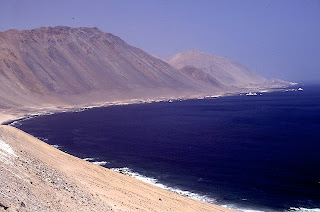 At that time, coastal Ruta 1 from the city of Iquique was only a dusty but scenic gravel road in an area with some of Chile’s most impressive beaches and best surfing, with little or no competition for waves. Southbound, my aging Argentine Peugeot pickup could barely make the steep grade over the hill where the Galleguillos tunnel has now simplified communication between the two cities, which are about 230 km apart. The larger port of Antofagasta is 180 km farther south. 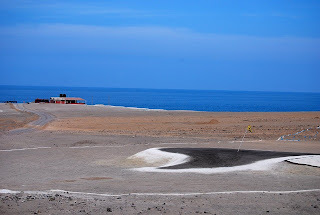 At that time, Tocopilla’s most unexpected site was its downtown baseball stadium where, on a sunny day with a cool breeze off the Pacific, I stopped briefly to watch a team from the local Asociación de Beisbol Tocopilla work out. Despite grand ocean views, the field itself was barely a sandlot - in reality, it was a hard dirt surface on which you wouldn’t want to dive or slide, and you certainly wouldn’t want to crash into the concrete outfield walls while chasing a long fly ball. 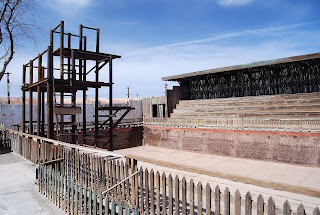 Nevertheless, baseball (owing its origins to the US presence in the copper mining industry) has been played here since 1928; in 2005, Tocopilla defeated Iquique for the national championship. 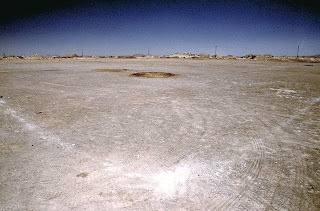 Other diamonds, such as the one pictured here at the nitrate town of María Elena, are scattered throughout the region. That was then, and this is now: on my last visit to the city, in December 2008, it was even more ramshackle, and the outfield was where those 500-plus families were still living in their mediaguas. This week, though, Chilean president Sebastián Piñera met local residents and pledged to finish a new hospital and build another thousand houses by next year. Then, perhaps, the Asociación de Béisbol can think about regaining the championship. Baseball, meanwhile, is not the only unexpected sporting presence in Tocopilla. 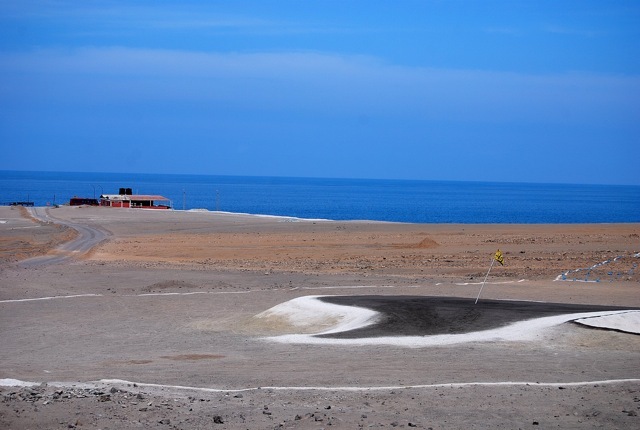 About 20 km north of the city, at the Tocopilla Golf Club, the “greens” consist of crushed black volcanic rock and the fairways are the brownest around (except for planted, or rather emplaced, plastic palms). The ocean views, though, are hard to equal anywhere this side of California’s Pebble Beach. Spanish, though, is a universal - well, almost. Even if we disregard for the moment the dozens of indigenous languages that existed at the time of the Spanish invasion - several of those languages are still in vigorous use - Argentine Spanish is losing ground to English in a manner that must horrify Madrid’s Real Academia Española, the self-appointed arbiter of Castilian correctness around the world. Precisely when this started in Buenos Aires, I don’t know, but the city’s popularity with foreign tourists has certainly contributed to it. On the one hand, it communicates with foreigners whose command of Spanish is limited or even nil. 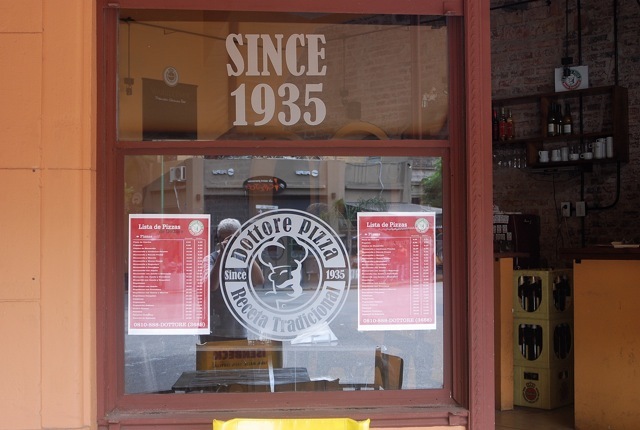 On the other, it implies that savvy locals can share in a perceived exclusivity. Likewise, you might see “summer sale” in lieu of “ofertas de temporada.” “Sale” is a particularly interesting term because, standing alone in Spanish, it can be interpreted as “get out of here,” but not in Rioplatense Spanish - because Argentines use the personal pronoun “vos” and its verb forms instead of the more common “tú,” an irritated Argentine who wanted you to leave would say “salí” instead. 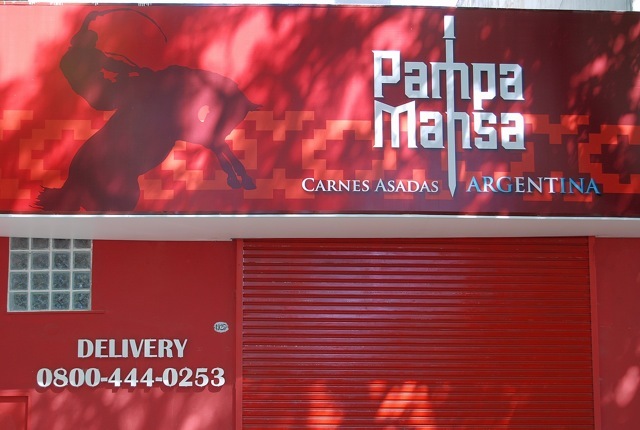 First-time visitors to Buenos Aires find, often to their surprise, that home delivery of meals is not just a matter of Chinese food or, more frequently, pizza - rather, it’s an everyday occurrence even for some upscale restaurants, not to mention ice creameries. Especially for those who rent apartments, it’s a convenient and rather cheaper alternative to dining out, as it avoids the “cubierto” (a “cover charge” per diner) and big tips (though the delivery man gets a small gratuity). 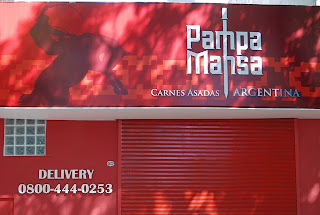 Even more conveniently, you no longer have to ask for “entrega a domicilio” - the simple English word “delivery” has become almost universal. While the use of Globish is most common in the tourism and service sector, it’s not unique to it. Few foreign visitors are likely to drive in the city, because public transportation is good and cheap, and will not need to park. 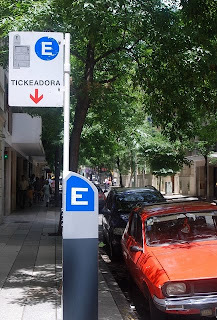 Not so long ago, though, city employees strolled the sidewalks to sell “boletas” (tickets) directly to drivers, for a certain period of on-street parking. 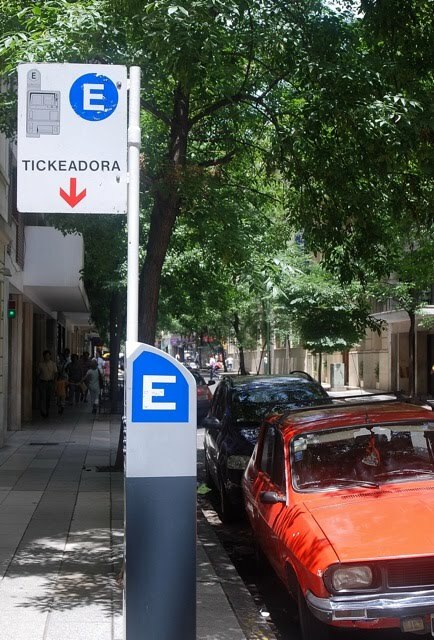 That’s no long true, as they’ve been replaced by automated “tickeadoras” such as the one shown here in the barrio of Recoleta (the English word “ticket,” by the way, can also refer to a restaurant receipt). In at least one case, the use of Globish is almost exclusively for locals. 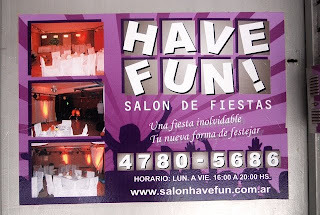 As the accompanying photo shows, a large events center has eschewed the Spanish “diviértense” (“enjoy yourselves”) for the more monosyllabical English equivalent. In any event, if you find an equally or even more amusing usage of Globish in Buenos Aires or elsewhere, please let me know via the email address in the header above. And have fun doing so. This means that Argentina, along with Chile and Brazil, is likely to raise “reciprocity fees” for US citizens by an equivalent amount, to US$140 per person (Brazil also requires an advance visa for tourists, which Argentina and Chile do not). 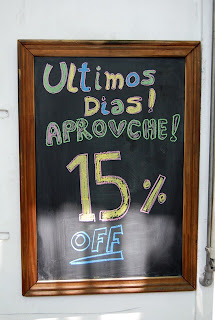 I’ve written several times about reciprocity fees, and the way in which they are counter-productive to a healthy travel and tourism sector in the three Southern Cone countries (and anywhere else, for that matter). There is still the possibility all three may eventually be included in the Visa Waiver Program (which would greatly benefit the US as well). While any increase in the fees is undesirable, the relatively small amount is probably not great enough to affect travel to the region to any serious extent. Anybody who’s already paid the fee will not have to worry about it, but those visiting any of these countries for the first time, or with a new passport, will get hit with the higher charge. In Argentina and Chile, the fee still does not apply to overland passengers, nor to air passengers entering anywhere other than Buenos Aires or Santiago, but in Brazil it applies at all border crossings. As the southern hemisphere winter sets in, there are few tourists along the Carretera Austral - which I have described as Chile’s top road trip - but what’s happening now in northern Patagonia’s Aisén region will have repercussions for the upcoming season and the coming decades. As Patrick Symmes details in the current issue of Outside magazine, the controversy over five new hydroelectric dams in the thinly populated region - two on the Río Baker and three on the Río Pascua - concerns a potential environmental catastrophe. In his article, Symmes details the controversy over two new dams on the Río Baker (pictured here) plus three on the Río Pascua, plus a 1,500-mile transmission line that would require a 500-mile clear-cut through its forests (the online version of the article will not be available until next month, but there is a gallery of accompanying photos). In a country that lacks conventional energy resources - Chile produces perhaps 10 percent of its own fossil-fuel consumption - half the electricity comes from hydropower, which many Chileans consider the default option. 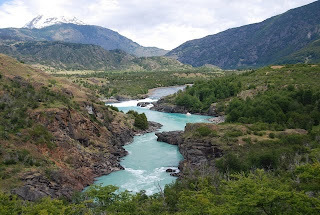 In terms of flow, the Baker is Chile’s biggest river and there are ideal dam sites along the Carretera Austral just north of the town of Cochrane (population about 2,200). Nevertheless, there is determined local opposition, including holdout farmers unwilling to surrender their prime bottomland even for an enormous payout that would set them up for life (it’s only fair to add that some locals support the project enthusiastically). 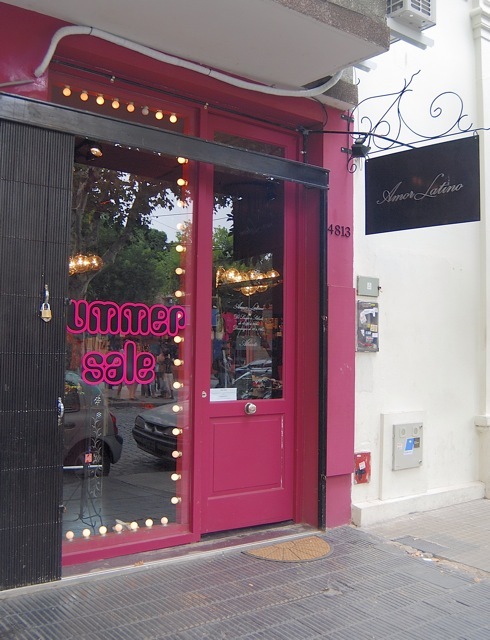 The nationwide campaign for Patagonia Sin Represas (Patagonia Without Dams) and others have done their utmost to publicize the threat to the Baker but, as Symmes says, they have relatively little clout among Chile’s power brokers. Except perhaps one: despite belonging to a center-right coalition, recently elected President Sebastián Piñera is a philanthropic conservationist who has set aside a large densely wooded portion of southernmost Chiloé as Parque Tantauco, a private nature reserve open to the public. In doing so, he followed the example of US conservationist Doug Tompkins, who created Parque Pumalín on the mainland across the Golfo de Corcovado, and with whom Piñera has cordial relations (unlike Chile’s previous center-left governments, some of which distrusted Tompkins intensely). I can’t begin to analyze all the intricacies of the Baker controversy here - either buy the magazine or wait until Symmes’s article comes online - but I did write about it in more detail in a post in late 2007. It’s worth adding that the project would also affect the pending Parque Nacional Patagonia, a project to which Tompkins and his wife Kris McDivitt are major contributors. It’s also worth adding that the hydroelectric project would not help Aisén residents directly - all the power generated would go to metropolitan Chile. Meanwhile, there’s another environmental controversy in the border town of Futaleufú, the whitewater rafting capital that’s the gateway to its namesake Class V river (pictured here). In its waters, scientists have discovered the so-called “toilet paper algae,” an invasive diatom that attaches itself to rocks and other submerged surfaces. Native to cool temperate regions of the Northern Hemisphere, but now found in New Zealand and Chile, Didymosphenia geminata kills off insects that fish feed on and, thus, could damage the area’s fly-fishing industry. 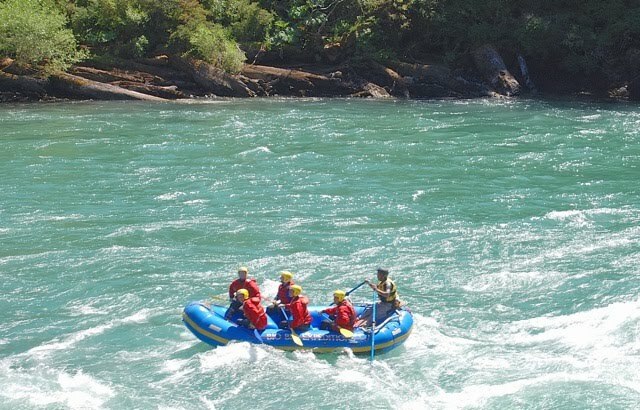 As the algae has likely arrived on rafting, kayaking and fishing equipment, foreign and Chilean operators may have to prohibit the use of imported gear. In the long run, it’s also a danger to the pristine clarity of the “Fu” and other rivers in the region but, unfortunately, local authorities seem to take it less seriously than the recreational operators.